We begin at the Royal Plateau on level 3, where Bartolomeo uses his barriers to block Gladius’s attacks. He also uses his barrier ability to create stairs to the forth level. Cavendish stay’s behind to fend off the giant Nutcrackers. Bartolomeo reveals the limits of his powers. He states that the surface area is limited, and he used it all on the stairs. Nico Robin also aids in the battle. She announces that she will not let Gladius lay a hand on Luffy, She uses her “Gigantesco Mano“. 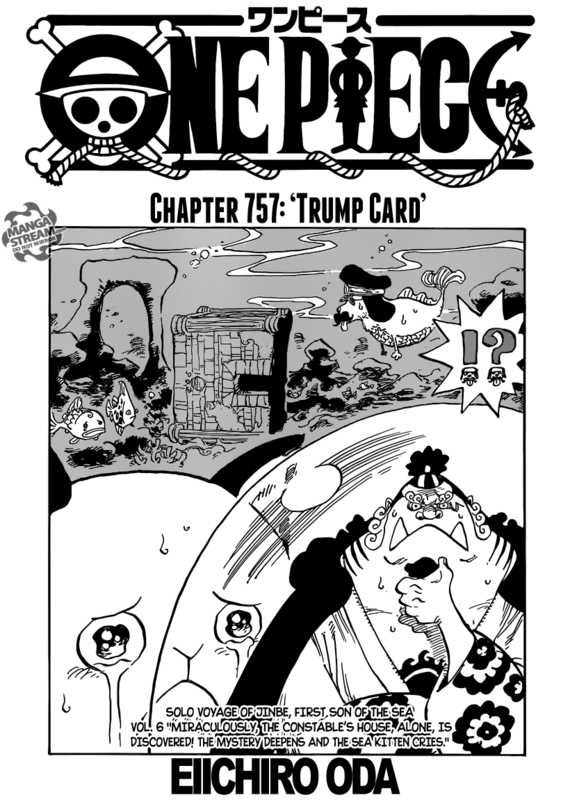 Meanwhile, we shift to Sabo and Fujitora. Fujitora uses his “Gravitation: Fierce Tiger“, a horizontal gravitational attack. Fujitora states that he wants to make Sabo “get serious”. 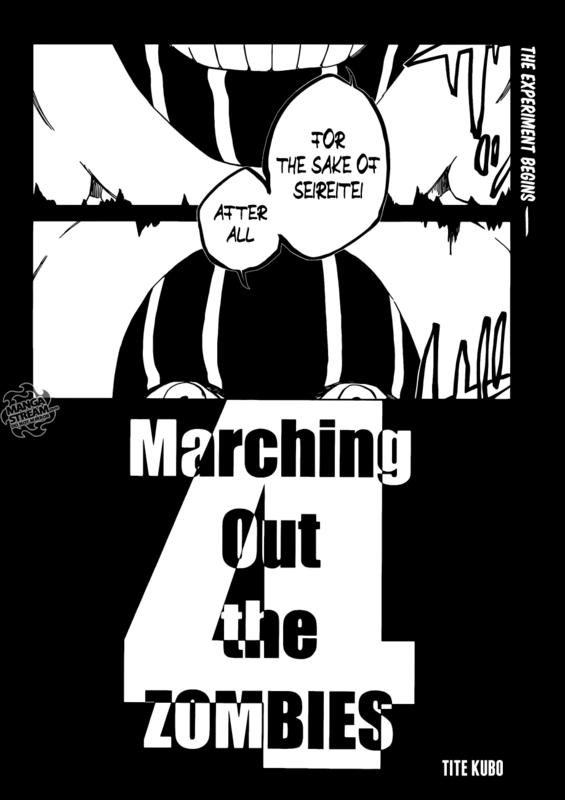 Finally, we head to the cliffhanger from the previous chapter. Diamante taunts Rebecca for running away, he attacks her and lands a hit. He continues to taunt her in regards to killing her mother. She screams for “Solider-San” to save her. Kyros arrives just in time to save, claiming that he wouldn’t allow Diamante to kill two of his family members. Kyros say’s that Rebecca will never have to fight again. Luffy and Law arrive and Lucy gives Law the key finally freeing him. 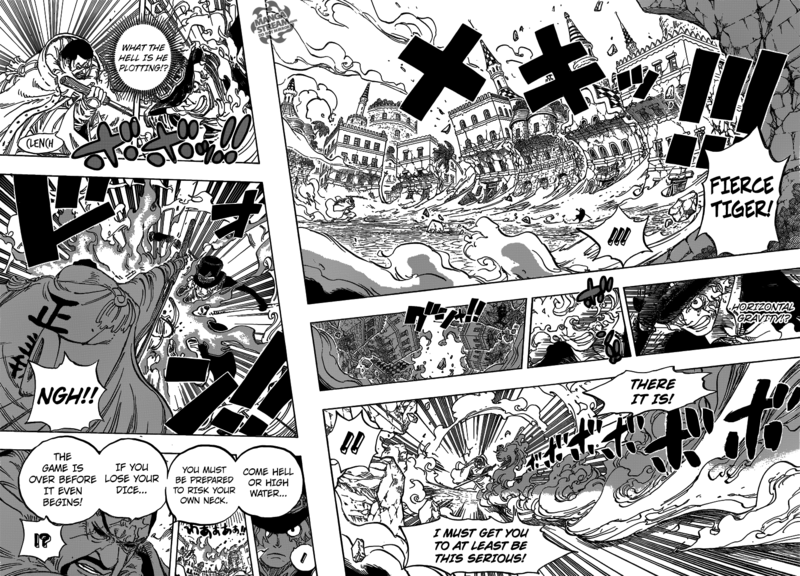 Luffy and Law aim to take out Doflamingo. 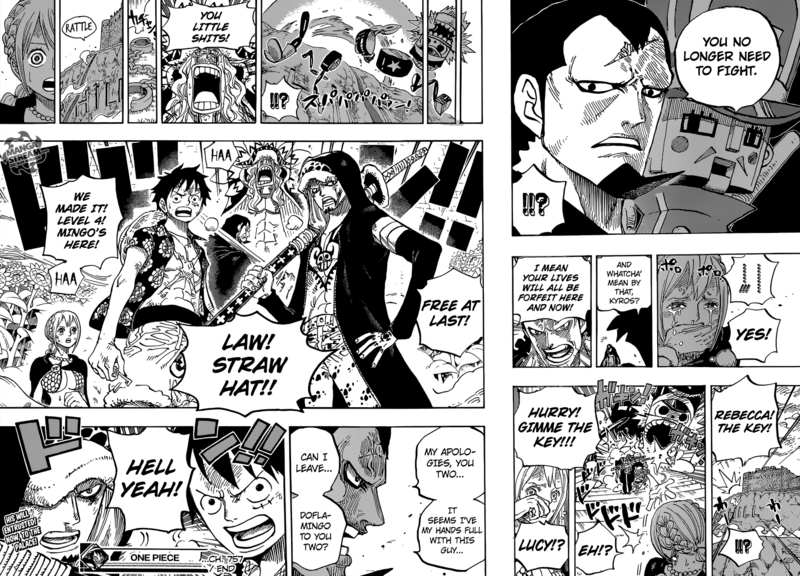 This chapter progressed the story nicely and I’m glad that Law finally got free. I’m still disappointed by the fact that there has yet to be a full no holds barred battle. Maybe Oda is simple setting up a series of battles the he would routinely go through in depth. I’m looking forward to that possibility. Sasuke, Naruto and Kakashi aim to combine their power to defeat Kaguya. 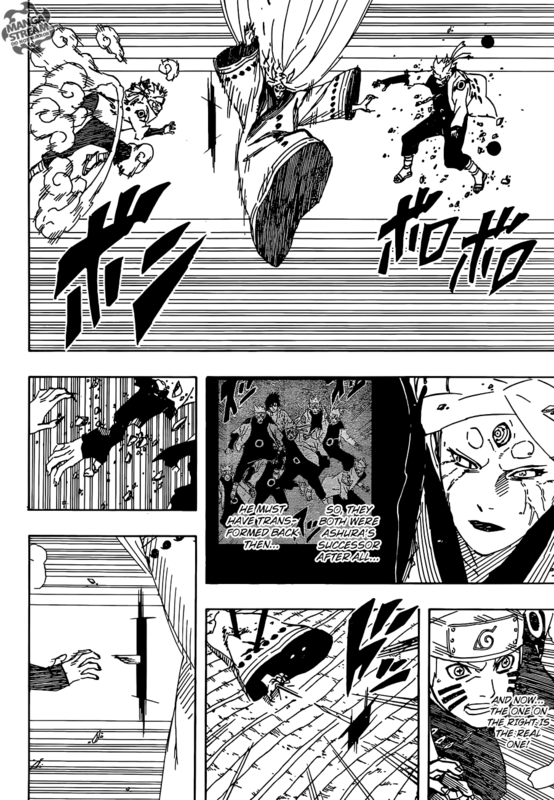 Kakashi uses his “Kamui” with shuriken, they hit there mark. Kakashi notes that Obito eye’s were amplified due the power he received from the six paths of the sage. Naruto notes that he thinks that Kakashi’s attack is “cooler” then Sasuke’s. Kaguya emerges and uses “Gudoudama”. Black Zetsu states that she combine’s all natures and it continues to grow indefinitely.Kakashi and the other conclude that they can’t out run it but must seal Kaguya. Kakashi give’s team seven a “final” mission. Kaguya proclaims that she is immortal and if Sasuke or Naruto dies they won’t be able to seal her. She quickly attacks, “piercing” Kakashi who allows the bone to slip through him. He uses “Kamui Raikiri” and pierces right through Kaguya, as Naruto and Sasuke attempt to seal her she pierces Naruto with her bone. Meanwhile, Black Zetsu (her other arm) opens a portal in front of “Sasuke”. Sasuke turns out to be the real Naruto and the other previously pierced Naruto is a clone. Kaguya is understandably confused and decides to move up only for Sakura to block her path and strikes her. The chapter ends with Sakura aiding , Sasuke and Naruto in establishing contact with Kaguya. The question will they finally seal her? 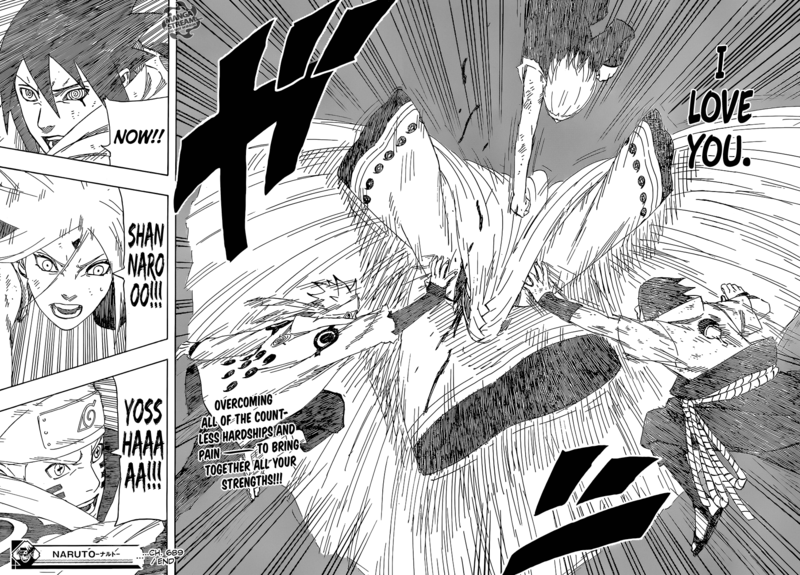 Sakura finally gets some shine and contributes to the “defeat” Kaguya. 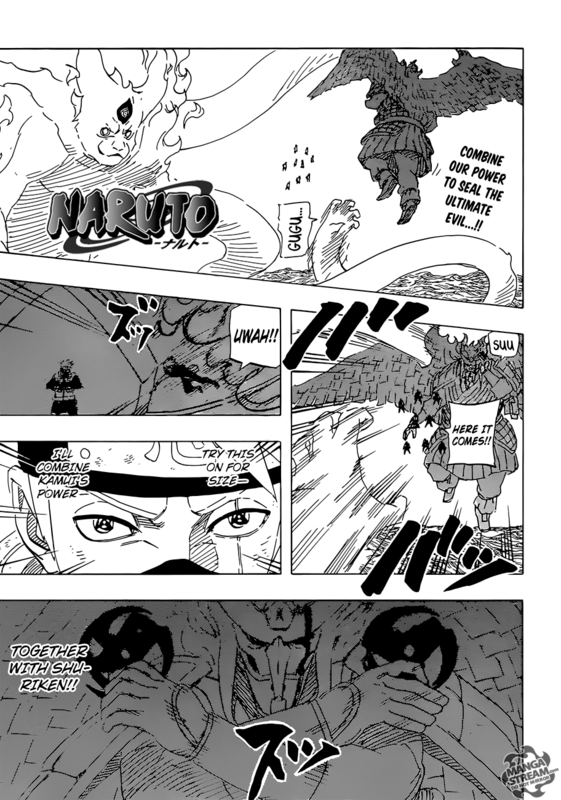 I loved this chapter it represented what was the best qualities of Naruto. This battle featured strategy, teamwork and cool attacks. Naruto as a series has gotten away from that instead opting for a “Naruto will save us (with a new rasengan)”. That said there’s no way Kaguya is defeated so easily considering that the Hokage haven’t even arrived. 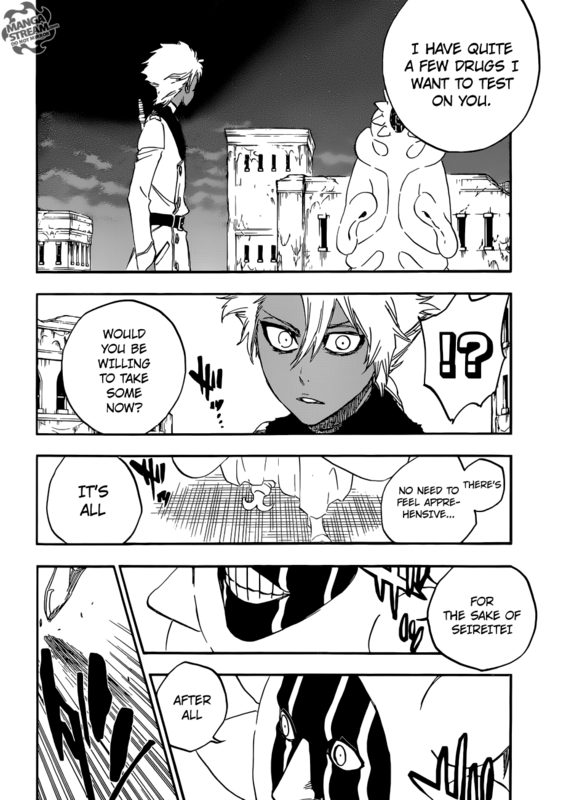 The chapter opens with Mayuri telling Hitsugaya that he has “a few drugs to test on him”. He asks him if he’s “willing to take some now”, and that it’s all “for the sake of the seireitei”. 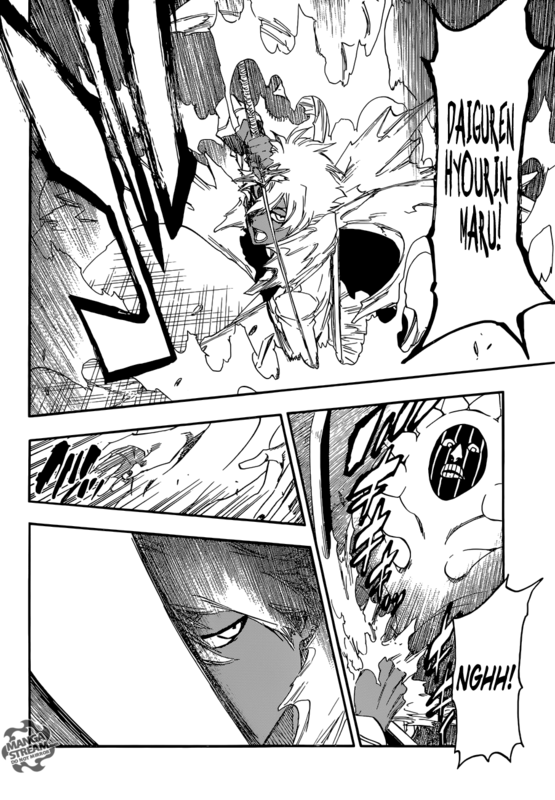 Hitsugaya mindlessly attacks Mayuri, he counters with a web shaped technique. Hitsugaya dodges and attacks again, Mayuri seems able to easily keep up with Hitsugaya’s barrage. Mayuri notes the he altered “Ashisogi Jizou”, such that it forces incoming blades to to make contact at an angle of 60 degrees or higher. Basically, his sword forces his opponents into a position where they will be easy to parry. Hitsugaya’s knee explodes and he freezes it, then uses Bankai. He appears to clearly made contact with his Bankai, but Hitsugaya quickly returns to then beginning when Mayuri asks him if he could try “a few drugs ” on him. Hitsugaya notices this “deju vu”, and wonders “what’s going on”. However, each restart does seem to have slight variations this time Mayuri is frozen completely before crashing to the ground in pieces. The fight still resets, Hitsugaya becomes angered now that he notices the reset. Mayuri states that “his drugs are the kind that bestows the user with marvelous new experiences including more power, perceptions, better reflexes and even courage that exceeds human understanding”. He’s giving Hitsugaya the ability “to see into the past”. He will be sent back into time every time a certain point is reached, this point is the moment when Hitsugaya kills Mayuri. He basically say’s that “if Hitsugaya doesn’t kill him, he will keep on living in the future”but, If he does kill him, his future stops. Mayuri mentions that the drug has a “small” side effect. Due to the fact that it effects short term memory the drug user can’t remember how many time they returned from the future. Hitsugaya can’t maintain his balance and collapses paralyzed. 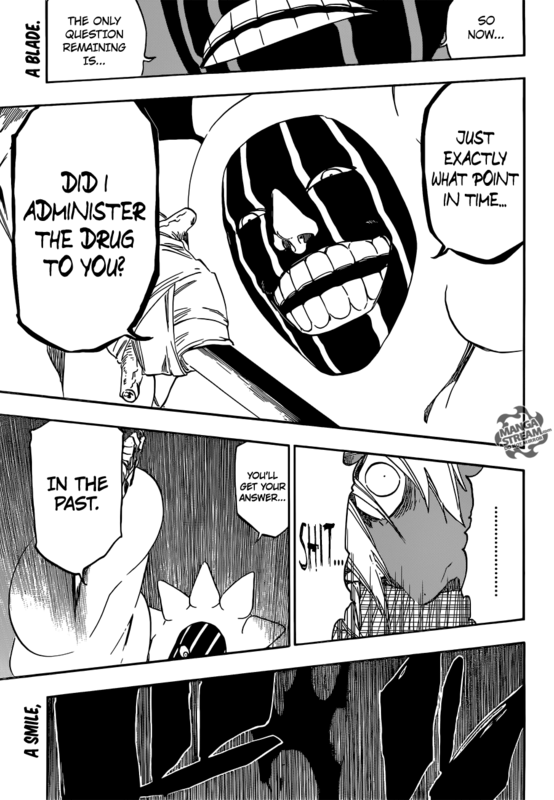 Mayuri asks “when” did he administer the drug, the answer “the past”. I’m “fanboying” hard for Mayuri and this chapter shows why. While more intellectual like Urahara he is capable of using his mind to increase his success in battle. The paradoxical situation he created with his drug is brilliant, I can’t wait to see how this fight concludes. Interestingly, Hitsugaya seem to have some level of understanding, so he’s not completely mindless after all. I hope we get a clearer understanding of the level of mental ability he can actually accomplish.